I visited Renee in her apartment overlooking Central Park near Lincoln Center. We spent a relaxed afternoon having coffee and talking about her life as a flutist. A member of the New York Philharmonic since 1974, Renee Siebert has consistently shown her versatility as a performer of solo, chamber music, and orchestral repertoire. For three seasons she appeared as a concerto soloist with the New York Philharmonic. She was soloist in Griffes’ Poem for Flute and Orchestra under Zubin Mehta. Ms. Siebert has collaborated with such artists as Jean-Philippe Collard, Emanuel Ax, Peter Serkin and Marc Neikrug. She has appeared with Music from Marlboro, the Chamber Music Society of Lincoln Center, Chamber Music at the Y, and with Peter Serkin and Tashi. She and several Philharmonic colleagues have given chamber music concerts and have coached chamber ensembles at Germany’s Bahnhof Rolandseck Festival. She has toured Japan twice, performing concertos and recitals and giving master classes. She has also recorded the complete flute works of Mozart on the Vox/Pantheon label with the Heilbronn Chamber Orchestra. At New York’s Merkin Concert Hall, she presented the world premiere of Judith Shatin’s Flute Concerto and later recorded the work for CRI. When and why did you start playing flute? I started playing the flute when I was about 12 or 13, because we had moved around a lot and were never settled until then. My sister was already going wonderfully on piano, my parents were asking if there were an instrument I would like to learn. And, I had seen a flute case on the playground and I thought it was very pretty, “The flute case is pretty. Look at the nice velvet inside and the flute looks like a jewel in there.” I went home and said, “Ok, get the flute. That’s what I’ll take.” I put that flute together and took it apart probably 50 times that first day. I had never heard a flute in my life. Did you study privately in the beginning? Yes, I did study privately from the start. My father called the band director right away, but my director was a double bass player; I wanted to study with a person who only played MY instrument. He located a college student for my weekly lessons. Were you a natural talent in Jr. High, or did you have to work to stand out? Unfortunately, the Richmond, Virginia public schools were not very advanced for classical music. There were no orchestras, only bands – marching and concert. There were state competitions for the bands themselves, and also a band made up of top players within the state. I was in those bands, but I didn’t do regular “solo & ensemble” competitions. There was one in Washington, D.C. where I played the Haydn Flute Concerto. I came in second there; I was probably 15 years old. My parents loved classical music, but participated only in high school – my father played trombone, my mother sang in the church choir. They were very supportive of us. My sister, Cynthia, was very influential. She was into classical music and modern dance. I looked up to her. She still plays, but is now a presenter and runs a very successful chamber music series in Kansas City. In fact, she accompanied me at the Kansas City flute convention. I was fortunate growing up in a famiily where I had access to a pianist who could practice and perform with me constantly. When you play a one-line instrument, it’s worth gold to be living with someone who plays the piano. We went through tons of flute and violin repertoire; and that got me going more than any teacher could. You must be an amazing sight-reader! (laughs modestly) Yeah, I was a good reader. Did you stay with your original teacher through high school? About three years after I started the flute, I began travelling to Washington, DC to take lessons with Mark Thomas, who at that time was principal in the National Symphony. My sister and I took theory lessons at American University. I had been studying with Mark for two years or so, when my family took a trip to Florida. In the hotel, my father happened to read in the paper that there was an open rehearsal nearby with the London Symphony Orchestra, Kurtez conducting and Barry Tuckwell doing the Strauss Horn Concerto. We got there for the last 20 minutes of the rehearsal. It was great. This was all part of a festival where students auditioned to take lessons, play concerts and receive coachings with the members of the orchestra. I auditioned for this the following year and spent the next two summers there. This is where I learned from another musician about the North Carolina School for the Arts. I remember the first time I heard a live orchestra. I was in the ninth grade and had only heard band sounds. What an immediate impression the strings made! Was this your first time to hear an orchestra? Yes, and one of the first concerts I heard had Daphnis and Chloe on it. I’m sitting there thinking, “Wow, this music …. what is this? And all of a sudden there’s the flute solo… and I was absolutely stunned. Afterwards, I went backstage. William Bennett was playing principal flute and Peter Lloyd was playing assistant principal. All these guys were so friendly. That was my first summer at the London Symphony Orchestra Festival in Daytona Beach. What a great piece to hear the first time, and with those players! Yes, really! Oh, and Geoffrey Gilbert was down there teaching, too. What was it like leaving home to attend the North Carolina School for the Arts? I attended NCSA for the 11th and 12th grades. I was always the oldest in my classes because I was a September baby. I must have been 17 when I enrolled. I lived on campus with my sister. The school focused exclusively on music, dance and drama. This was a great time for us. In Richmond not so many people understood what we loved. Suddenly we’re in this kind of paradise. The focus for me was music and flute only. My teacher was Philip Dunigan, who is still there. He had just come down from NY with his woodwind quintet. He was a very good teacher, very good in rudiments – etudes, scales, etc. It was an “Everyday – you must do this…” kind of thing -Andersen, Jeanjean, etc. depending on the level of the student. His other emphasis was sound – quality of sound. He had a really sweet beautiful, beautiful sound. He had me doing long tones, starting ppp, metronome on 60, and crescendoing for 5 or 6 beats to as loud as you could, and then back again, on every note of every octave. NCSA had a reputation for attracting and developing good flutists. Yes, there was Ransom Wilson, Rebecca Troxler, Chris Neal, maybe 5 or 6 of us. Oh, and Sandra Miller had just left for Curtis when I got there. Oh yes, but certainly different. It’s still turning out professional artists in all of those fields and so much more now since it’s expanded into visual arts, etc. Dunigan is a wonderful wonderful teacher. I can’t say enough about the school. Back then, when it was in its infancy, things were very relaxed, plus, it was in the 60s, it was a less structured environment. I could have a lesson 3 or 4 times a week if I wanted it. It’s probably a lot more structured now. 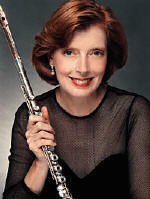 Renee, when did you decide to become a professional flutist? I knew before going to NCSA that playing the flute was the one thing in my life that I wanted to do. I think I knew, that when I was 15, after a couple of years of playing. At 15, what did you think being a professional flutist was all about? Being a band director? A teacher? Orchestral player? No, and again, this just comes from my own personal experience playing with my sister, I just wanted to play flute and piano repertoire. Weren’t you concerned about making money? Oh, I knew I wanted to make money, but only so that I could do the flute/piano stuff, and I wanted to make recordings. I didn’t know then how much fun it was to play with a group of people. It wasn’t until I got to NCSA that I had chamber music exposure. What series of events led you to Juilliard for college? I had always wanted to come to NY. I had been here twice on brief trips with the family. I loved the city; it was so exciting. There weren’t many playing opportunities in Richmond. My sister and I had pretty much exhausted the possibilities there. NY had so much more to choose from. Did you consider other music schools besides Juilliard? No, I took one audition and it was Juilliard. I had not met Baker at that time. Ransom had come up the year before, and so had Rebecca Troxler, plus my teacher Phil Dunigan had said that Juilliard was the place to go. I spent four years there. I had fun at Juilliard. I’m probably singular in saying that, but when I got there, there were all these terrific players that I could ask to play with me. I loved that. My first year, I was playing in three different woodwind quintets. That was just the way I grew up -always wanting to play. My father had taught me that if there was something you wanted to do, you should just ask. The worst they could say was no. It just seemed simple to ask others to play. My teacher was Julius Baker and I had a lesson every week. What was a lesson like? Was it structured in the way you were used to at NCSA? No, it was very unstructured. I was accustomed to being told to practice this or that, but when I got to Julie’s class; he would look at me and say, “What do you have to play?” I was still in need a little bit of more structure. But I hung in there. I ended up building my own resources and learned to structure myself. I think that Julie was best working with students who were already somewhat finished players, so that he could then bring that person’s playing to yet another level; and he did so by playing. He would play in the lessons, or I would hear him in the orchestra, or I would hear someone else’s lessons. Julie was able to help me listen at a much more acute level. It sounds like you were innately good with structuring your lessons. It took me a couple of years. And I have to say; I didn’t do that many etudes at all. On my own I did scales and arpeggios, etc. but Julie didn’t ask me to play them. You joined the Philharmonic in 1974. Did Mr. Baker encourage you to audition? Well, maybe a little bit, but I always thought, “I don’t want to play in an orchestra,” so I never practiced any of the orchestral excerpts. He assumed, I think, that I was doing that. And he would say occasionally, “Well you ARE practicing your excerpts, aren’t you?” I wouldn’t want to talk much about it. I had my own agenda. It wasn’t until my last year at Juilliard when Bobby Morris, who used to play second flute in the Philharmonic for a number of years, retired. Suddenly there was an opening in the Philharmonic. All the students got busy preparing. I thought, “I’m not going to take that audition. I don’t want to be in an orchestra, and who in their right mind is going to take a student to be in that orchestra anyway?” Then, in February my flute (a Powell) got stolen on the subway. Julie said he would loan me one of his. I immediately forgot about my flute, because I loved this one so – it was an older 1400 series Powell. I asked if he’d ever sell it. He said, “You get a job in an orchestra, and I’ll sell you that flute.” Well……..
(laughing) Yeah, he bribed me. My class had Michael Parloff, Trudy Kane, and Nadine Asin – wonderful players. Baker wanted all of his students to take the audition. I went to Marlboro that summer and took the excerpts with me. I practiced them as if I was going to play them in recital in front of 2,000 people. I practiced a lot. I had the scores, too. Practicing them like they were not just 8-measure etudes, but as if they were concertos, made a difference. My last year at Juilliard I played a lot of concertos with a chamber orchestra. I was out there playing often in front of lots of people, which helped considerably. Everyone auditioned. There was a preliminary and final round. This was before things were done with the screen. And there was a huge list – both first and second parts. In the first round I played probably 10 minutes. What flute were you playing at the time? You mentioned yours had been stolen a few months before. I had no instruments (laughs). I was playing Julie’s Powell, and I was playing a friend’s piccolo. I was playing all borrowed instruments in the audition. Who was on the listening panel? Members of the wind section – the principals and assistant principals, and the whole flute section. Can you tell me about the final round? There were seven of us in the finals. Pierre Boulez, the music director, was present. It took place in the Juilliard Theatre; the wind section sat in the audience. There was a lot of sightreading. I remember Boulez putting up the last movement of the Bartok Concerto for Orchestra, the first flute part – all the sixteenths with the strings; I’d never seen it before. He said, “Take a few minutes and look at it. There IS a pattern there.” And I’m thinking, ok, pattern, pattern, where’s the pattern …. ? I found it and played it a couple of times. They also wanted the Polonaise from Bach’s B minor suite and one of the movements from Messian’s Oisseau Exotiques, which contained a lot of rhythmic changes. I remember thinking what Gerry Schwartz, a friend of mine had said; that two of Boulez’s emphases were rhythm and intonation. So I thought, ok, here it is – I’ll concentrate on that. Two days later, Julie called to say I had gotten the job. Who was in the section then? Julie, Billy Heim, piccolo, and Paige Brooke, assistant principal. I was the first woman to go into the wind section, and I was the 7th woman in the orchestra. Now there must be 30 -35 women in the orchestra. It’s really wonderful. Do you ever think what your alternatives would have been had you lost the audition? I had already signed a contract to do a 3-week Marlboro tour, which the Philharmonic made me get out of, so losing the audition would not have been a catastrophe. At that time, it was difficult to get off a couple of weeks to go play somewhere else. Now, the policy is less strict. Did you do much freelancing in NY before joining the Philharmonic? What were those days like? Not really, one summer I drove with four others out to California and rented an apartment in the Bay area. I would take the bus over to San Francisco and go stand on the street corner and play. Most of my serious playing was in the form of concerts that I generated myself. Also, the woodwind and string faculties were active performers, and I would ask them about playing opportunities. Do you think it’s different now for freelancers in the city? Is it harder now for flutists to connect? Probably. There are so many more players. Would you like to comment on the state of flute playing today? Do you think levels/styles have changed since 1974 when you joined the orchestra? I think the flute players in 1974 were great players. There are many more players now. I think teaching has changed. It’s gotten so much better, and has made it so that more people have more information about how to play this instrument, and to play it well. There are also younger people starting the instrument who can be already somewhat accomplished by say 14 or 15. Do you structure your lessons? Yes, I do, depending on the students’ needs. I try to get them to be as independent and responsible for their own playing, because eventually that’s what they’ll need to be. You’ve got to be able to support yourself and figure out the mystery of “why am I not getting this particular passage, or what is it that I want to say.” To me, the idea of teaching is to help students be able to answer their own questions and troubleshoot their own problems. I read somewhere long ago that the role of a good teacher is to make him/herself unnecessary in the shortest time possible. Any advice you’d give someone aged 13, the age you were back when you decided to be a professional flutist, considering the opportunities available today? My advice would be to WORK. There is no substitute. Just work and practice hard. Go through as much repertoire as you possibly can. What kind of flute do you play? I have a Powell flute that was made in 1959 with a Jorg LaFin 14K gold headjoint. LaFin is a German player who makes only headjoints. Three years ago I tried one of these and thought it was stupendous – and I’m not a fan of gold. Jeannie, Mindy, the Berlin and Vienna Philharmonics’ sections have them. He’s sold many of them in Germany and Japan. He used to play extra flute/piccolo in the Berlin Philharmonic but left to do this. Is your flute the one Mr. Baker promised to sell you for winning the Philharmonic audition? No, he never sold me that instrument (laughs). Sometimes, and I find it a fun instrument to play in the orchestra. I’ve heard you play in recital settings on several occasions, so I know firsthand that you’re a great solo flutist. Do you get many opportunities to play principal flute? Would you consider taking principal auditions? Over the 24 years I’ve been a member of the Philharmonic, I have had plenty of opportunities to play principal parts and have enjoyed it. But I have very little interest in taking any more flute auditions now. Do you know what will happen with the principal position now that Jeannie’s retired? Well, we’ll have auditions at the end of November. There was a stack 6 -8 inches high of applications. Was yours in the stack.? No. No, no. I’m doing more chamber music and solo playing which I love, and I feel very comfortable and happy with my current job. Do you ever have nightmares about upcoming performances? Not really, oh sometimes a dream about my flute breaking in half, or I can’t find a piece of my flute. My recurring nightmare is that I’m about to go onstage and suddenly I realize that my music folder is at home. (laughing) Right, right, and people are expecting you to have it from memory and you never heard the piece before. Now, about your upcoming concert – have you been featured on the Flute Club’s series before? Yes, I have. I believe Eleanor Lawrence was president then -it must have been in the early 80s. It’s been a while. I notice your program for the upcoming concert at CAMI includes music from virtually all the musical periods. Does this mean you enjoy all types of music? Not only do I like this type of program, but also I love these particular pieces. It is also a practical program for me because it’s music that I’ve either done recently, or that I’ve just done so much of. Considering my schedule with the Philharmonic and my children, I have a limited amount of time to get it all together. We played all the Beethoven Symphonies for the first three weeks of our season, and the Serenade was written around the same time as the Second Symphony. So, before we played the Second Symphony orchestral concert at Avery Fischer, I played the Serenade with my colleagues as a pre-concert. It was that group that I had hoped to transport onto this program for the Flute Club. It turns out the violinist is not in town, but our new assistant concertmistress Sheryl Staples is doing it, along with assistant principal violist Rebecca Young. Also, I have always had a particular love for the French impressionistic repertoire. It may go back to the “sound” emphasis I developed at NCSA. Contemporary music too is great for interesting and different sounds. Jon Deak’s piece is based on a Haitian folk tale. It’s ten minutes long. We speak in it because one of Jon’s strengths is in utilizing the talents of musicians as actors. He’s always been in love with fairy tales and folk tales from all over the world – and their meanings, conscious and subconscious. This is a delightful children’s story, but also a meaningful adult story told in a very charming way. I have two beautiful daughters, 10 and 12. They love the Spice Girls and Janet Jackson, but they also love Telemann and Schubert. My oldest daughter enjoys the opera, so we sometimes go to the Met. Our cat Chloe, from the ASPCA, is named after their friend’s cat by the same name, only ours is Chloe II. She’s very sweet. Is there a final comment you’d like to make to the members of the New York Flute Club? Are you a member?